For anyone who wonders whether this is new territory or untrodden terrain, I can confirm that it isn’t. 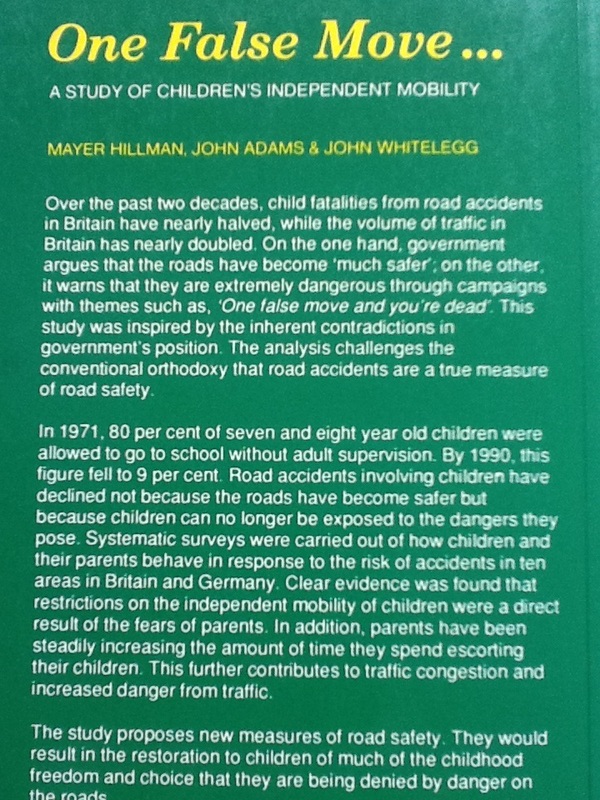 The book ‘One False Move’ [pdf] deals with the issue of the school commute and (what the UK calls) road safety… in 1992. It draws devastating conclusions about the then-current approach – sounding quite current still in 2015 (see photo insert below for its ‘heart-hitting’ backcover). Maybe a follow-up study, if conducted, would show that very little, if any, progress has been made since. So sad that we’ve come to such a situation where in a time of peace and people being more civilized than they ever have been, people are told to be afraid of dangers. Sadly in the Anglophone world, child casualties are considered to be acceptable collateral damage as part of the motoring economy, and the Taliban approach to road safety is deeply embedded. It is highly notable that the majority of cycle campaigns, concentrate on the “rights” of adults to cycle in a vehicular manor. There hasn’t been an English language version of the Stop de Kindermoord campaign, the question is why? The “Child Effect” is an interesting one. When someone tells me that an existing cycle facility is “perfectly adequate” then I ask them if they’d let their children use it to cycle to school. This is usually met with spluttering, as if it’s a ridiculous question and such a thing is completely unthinkable. Meanwhile, not so very far away, the average Dutch child cycles to school independently at age 8. I’m lucky that I live in a small village where my five year old daughter can pedal to school (“illegally”) on foot paths and no one really minds. I’ve started to encourage to use the road at a couple of points where it is very quiet, and on the approach road to school where there is no room on the path due to cars half-parked on it. Needless to say I detect horrified stares and quiet tutting from the other parents. The road, even on the dead-end back streets of a quiet village with a 20mph limit, is an absolute No-Go area for their kids and encouraging my child to cycle on it is clearly reckless endangerment.